Collecting Kennedy half dollars is a fun and challenging way to start a coin collection. The Kennedy half dollar is perhaps one of the most famous coins today — though its birth had a terribly unfortunate cause. That was the assassination of President John F. Kennedy on November 22, 1963 in Dallas, Texas. Ever since the first Kennedy half dollars rolled off the United States Mint presses in 1964, the coin has been immensely popular. In fact, widespread hoarding of the coin in the mid-1960s by individuals who wanted a memento of the fallen president is believed by many numismatists to be the reason the half dollar denomination doesn’t circulate well today. Soon after President John F. Kennedy’s assassination in Dallas, Texas on November 22, 1963, the first Kennedy half dollar was made in 1964 — and almost immediately, millions of Americans began saving the half dollar as a memento of the fallen president. That’s right, people habitually began keeping Kennedy half dollars, and thus the half dollar soon no longer circulated. Did You Know?… The Kennedy half dollar coin replaced the Franklin half dollar and was conceived of, approved by the U.S. government, and minted all in a matter of only a few weeks’ time. You might be surprised to learn that Kennedy half dollars are still being made today — but they’re not made for circulation anymore! The last business-strike half dollars (those made for distribution through banks) were struck in 2001. The United States Mint still makes half dollars for coin collector sets — but those half dollars are generally not rare. So you want to build a Kennedy half dollar collection… where do you start? Which Kennedy half dollars should you be looking for? Let’s take a closer look at some of the most popular ways to build a Kennedy half dollar collection and the most valuable Kennedy half dollars. 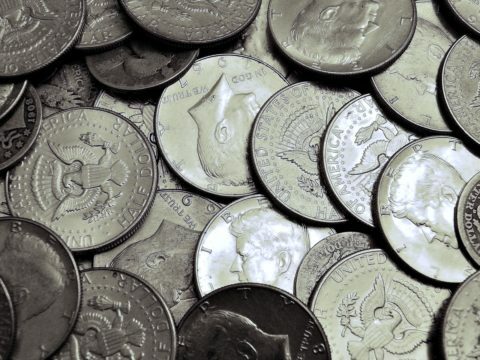 While you can just as well collect any and all half dollars that come your way, many coin collectors prefer a more organized approach to collecting Kennedy half dollars. #1 – Most numismatists who collect Kennedy half dollar coins will go after each date in the series — paying attention to the various mintmarks as well as any varieties. #3 – While most people collecting Kennedy half dollars will try to acquire at least these 5 designs, many will go on to collect each date-and-mintmark combination in the entire series. That means you try to collect each and every Kennedy half dollar made since the first one was released in 1964. #4 – Some collectors also seek one of each example from the Philadelphia, Denver, and San Francisco mints from each year — including all circulation issues and any collectible proofs. Most people think that Kennedy half dollars are worth than face value. The silver ones, yes — those are worth more (1964-1970; 1976). But the ones made from copper-nickel clad usually have no additional value. There are many other Kennedy half dollar varieties, out there (including other “No FG” and doubled die half dollars) — but they are less common. Your best bet is to take a good look at all of your Kennedy half dollars and search for any signs of errors. Who knows?… You may be the first person to discover a new type of rare Kennedy half dollar! Generally speaking, most Kennedy half dollars aren’t really rare — because billions have been made and they are still around. But since they were hoarded from circulation many years ago and so few people spend them anymore — they’re mostly in coin collections, change jars, and bank vaults. As you’ve probably noticed, there aren’t very many Kennedy halves floating around in circulation — I mean you don’t get them in change at your local fast food restaurant anymore. Half dollars have been pretty much extinct from circulation since 1980 or so. Even your bank may not have any half dollars these days! Still, I recommend that you start by asking for rolls of halves at your bank. If they don’t have any half dollar rolls on hand, they can probably order them for you. If the bank doesn’t have any half dollars, then you can buy them from a coin dealer. I look for half dollars in coin rolls from a local bank. You can buy a roll of 20 half dollars for face value (just $10) and look for all kinds of old and valuable half dollars this way! I have personally found many silver, proof, and other cool half dollars while looking through bank rolls. So, if you’re going to collect Kennedy half dollars, you will most likely need to visit your local bank (as I mentioned above), a nearby coin dealer (each coin dealer has their own catalog of coins they have available), or look for them on eBay. You can also order Kennedy half dollar rolls or annual mint or proof sets from the United States Mint. Collecting Kennedy half dollars isn’t easy — or cheap — but it sure is fun! See all Kennedy half dollar values.